In this year of 2018 - 5779, in the months of Kislev/Tevet there are two Holidays celebrated in both the Western Secular World and the Jewish World. Many people in the Jewish World follow the familiar statements of the western secular world - May there be peace on earth and good will towards men. Then many people put their new bought presents under the Xmas Tree or the Chanukah Bush. This is due to the advertising and commercial aspects of the society. We are going to show that the two holidays are very different than each other. Chanukah is not a Holiday that discusses good will towards men or Peace on earth. Let us learn. We will be teaching a number of classes on this Holiday including a meditation Yichud called Yichudim NER and also the Kabbalistic Meditations of the ARIzal as explained by the great Kabbalist Rabbi Shalom Sharabi. These will be found below. Chanukkah is a Holiday in the Hebrew Calendar; it is spelled חֲנֻכָּה. In the north area of Tiberias: Ḥănukkāh, is usually spelled חנוכה. This is very usual in Hebrew where the letter Vav can be produced with a vowel of dots or a vowel using the letter Vav. Chanukah is pronounced (Chanukah) in Modern Hebrew; a transliteration also romanized as Hanukah, Chanukah, Chanukkah or Chanuka). This Holiday is also known as the Festival of Lights and Feast of Dedication. It consists of an eight-day holiday commemorating the rededication of the Holy Temple (the Second Temple) in Jerusalem at the time of the Maccabean Revolt against the Greeks of the 2nd century BCE. Hanukkah is observed for eight nights and days, starting on the 25th day of Kislev according to the Hebrew calendar, which may occur at any time from late November to late December in the Gregorian calendar. 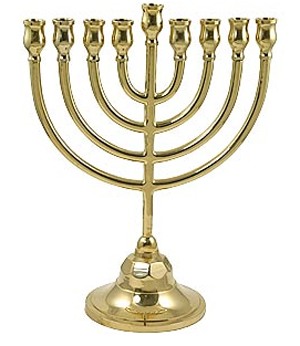 The typical Menorah consists of eight branches with an additional raised branch. The extra light is called a shamash (Hebrew: שמש‎, "attendant") and is given a distinct location, usually above or below the rest. The purpose of the shamash is to have a light available for practical use, as using the Hanukkah lights themselves for purposes other than publicizing and meditating on the Hanukkah is forbidden. The main point of the Holiday according to the Halacha, mentioned above is to publicize the miracle. What is the miracle? How does one publicize the miracle? In this age of electricity why would i use the light of the Hanukiah to have normal everyday benefits? These are just some of the questions we will address as we go through the Wikipedia process. The name "Hanukkah" derives from the Hebrew verb "חנך", meaning "to dedicate." On Hanukkah, the Jews regained control of Jerusalem and rededicated the Temple. Many homiletical explanations have been given for the name: The name can be broken down into חנו כ"ה, "(they) rested (on the) twenty-fifth," referring to the fact that the Jews ceased fighting on the 25th day of Kislev, the day on which the holiday begins. chanoch asks, "Why is the Holiday 8 days when they stopped on the particular day of 25th of Kislev, and why not start the Holiday on the 17th and end it on the 25th?" Remember this is not a Holiday mentioned in the Torah. It is a Rabbinical Holiday. 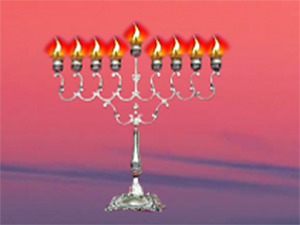 חנוכה (Hanukkah) is also the Hebrew acronym for "Eight candles, and the halakha is like the House of Hillel": ח נרות והלכה כבית הלל . This is a reference to the disagreement between two rabbinical schools of thought — the House of Hillel and the House of Shammai — on the proper order in which to light the Hanukkah flames. Shammai opinionated that eight candles should be lit on the first night, seven on the second night, and so on down to one on the last night (because the miracle was greatest on the first day). Hillel argued in favor of starting with one candle and lighting an additional one every night, up to eight on the eighth night (because the miracle grew in greatness each day). Jewish law adopted the position of Hillel. These different schools of thought which are clearly difficult to reconcile are reconciled with the idea that the halacha will change after Mashiach since the world will be based on judgment rather than mercy when Mashiach comes. Actually these Halachot are dealing with the way the spiritual physical systems work with each other. Day 3 - Light of Hod comes into the Vessel of Binah while the light of Yesod flows down to Chesed while the Light of Malchut flows down to the vessel of Gevurah. Day 4 - Light of Netzach comes into the vessel of Binah while the light of Hod flows down to the vessel of Chesed while the light of Yesod flows down to the vessel of Gevurah while the light of Malchut flows down the vessel of Tiferet. This continues day by day until on Day 8 which is called Zot Chanukah all of the lights have flowed into the appropriate vessels. Thus on day 8, the light of Binah flows into the vessel of Binah while the light of Chesed flows into the vessel of Chesed, etc. This process of step by step the proper light searches for the proper vessel is due to the idea of Line. After Mashiach there will be no more step by step. In the metaphor of the circle the Light of Binah finds the vessel of Binah immediately. This is the idea that there is no room or space to create a mistake. Things just work properly. Everyone is a Tzadik and doing the right thing. Don't you think this will be boring? No, there will be no boring because boring is a lack and if the proper light flows into the proper vessel there is no lack. This is the true meaning of Mashiach. SEVEN TIMES NO, A THOUSAND TIMES NO! 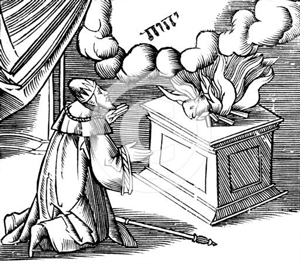 According to the Gemara volume "Gittin," the king asked each son to bow down to an idol. Each son, starting from the oldest to eventually the youngest refused, each quoting a different passage from the Torah. The first son quoted the first commandment, "How can I bow down?" he asked, "when it says in the Torah, "I am the L-rd your G-d.' "
The second son stated the commandment: "You shall have no other gods beside Me." Said the third: "How can I? Whoever sacrifices to a foreign god will be wiped out of the Jewish people." Quoted the fourth son: "You shall not bow down to other gods." The fifth son quoted the "Shema" -- "Hear O Israel, the L-rd G-d, the L-rd is One." The sixth son explained: "You shall teach today your heart that Hashem is the only G-d in the heavens and earth and there is no other." Finally, the merciless king turned to the seventh and youngest son who quoted the longest passage: "We have sworn to HaShem not to change Him for any other god and G-d has sworn to us not to exchange us for any other people." The king was taken aback. This boy was the youngest, yet the most clever -- and also willing to give his life. Nonetheless, the king tried to deceive him: "I'll throw my ring down," he said, "and so people won't ridicule me it will look like you're bowing down, but really you'll only be picking up the ring." No luck, Antiochus. The brave lad said, "If your honor as a human being of flesh and blood is so important, then how much more so is the honor of the King! The story of Hanukkah, along with its laws and customs, is entirely missing in the Mishna apart from several passing references (Bikkurim 1:6, Rosh HaShanah 1:3, Taanit 2:10, Megillah 3:4 and 3:6, Moed Katan 3:9, and Bava Kama 6:6). Rav Nissim Gaon postulates in his Hakdamah Le'mafteach Hatalmud that information on the holiday was so commonplace that the Mishna felt no need to explain it. A modern-day scholar Reuvein Margolies suggests that as the Mishnah was redacted after the Bar Kochba revolt, its editors were reluctant to include explicit discussion of a holiday celebrating another relatively recent revolt against a foreign ruler for fear of antagonizing the Romans. The Gemara (Talmud), in tractate Shabbat, page 21b, focuses on Shabbat candles and moves to Hanukkah candles and says that after the forces of Antiochus IV had been driven from the Temple, the Maccabees discovered that almost all of the ritual olive oil had been profaned. They found only a single container that was still sealed by the High Priest, with enough oil to keep the menorah in the Temple lit for a single day. They used this, yet it burned for eight days (the time it took to have new oil pressed and made ready). 3. The most preferred practice is to vary the number of lights each night. In Sephardic families, the head of the household lights the candles, while in Ashkenazic families, all family members light. Except in times of danger, the lights were to be placed outside one's door, on the opposite side of the Mezuzah, or in the window closest to the street. Rashi, in a note to Shabbat 21b, says their purpose is to publicize the miracle. The blessings for Hanukkah lights are discussed in tractate Succah, p. 46a. "Now Judas celebrated the festival of the restoration of the sacrifices of the temple for eight days and omitted no sort of pleasures thereon; but he feasted them upon very rich and splendid sacrifices, and he honored God and delighted them by hymns and psalms. Nay, they were so very glad at the revival of their customs, when after a long time of intermission, they unexpectedly had regained the freedom of their worship, that they made it a law for their posterity, that they should keep a festival, on account of the restoration of their temple worship, for eight days. And from that time to this we celebrate this festival, and call it Lights. I suppose the reason was because this liberty beyond our hopes appeared to us; and that thence was the name given to that festival. Judas also rebuilt the walls round about the city, and reared towers of great height against the incursions of enemies, and set guards therein. He also fortified the city Bethsura that it might serve as a citadel against any distresses that might come from our enemies." Another source is the Megillat Antiochus. This work (also known as "Megillat HaHasmonaim," "Megillat Hanukkah," or "Megillat Yevanit") is in both Aramaic and Hebrew; the Hebrew version is a literal translation from the Aramaic original. Recent scholarship dates it to somewhere between the 2nd and 5th Centuries, probably in the 2nd century, with the Hebrew dating to the 7th century. It was published for the first time in Mantua in 1557. Saadia Gaon, who translated it into Arabic in the 9th century, ascribed it to the Maccabees themselves, disputed by some, since it gives dates as so many years before the destruction of the second temple in 70 CE. The Hebrew text with an English translation can be found in the Siddur of Philip Birnbaum. The Christian Greek Scriptures refer to Jesus being at the Jerusalem Temple during "the Feast of Dedication and it was winter" in John 10:22–23. The Greek term used is "the renewals" (Greek ta engkainia τὰ ἐγκαίνια). Josephus refers to the festival as "Lights." Judea was part of the Ptolemaic Kingdom of Egypt until 200 BCE when King Antiochus III the Great of Syria defeated King Ptolemy V Epiphanes of Egypt at the Battle of Panium. Judea became at that moment part of the Seleucid Empire of Syria. King Antiochus III the Great wanting to conciliate his new Jewish subjects guaranteed their right to "live according to their ancestral customs" and to continue to practice their religion in the Temple of Jerusalem. "The king being thereto disposed beforehand, complied with them, and came upon the Jews with a great army, and took their city by force, and slew a great multitude of those that favored Ptolemy, and sent out his soldiers to plunder them without mercy. He also spoiled the temple, and put a stop to the constant practice of offering a daily sacrifice of expiation for three years and six months." When the Second Temple in Jerusalem was looted and services stopped, Judaism was outlawed. In 167 BCE Antiochus ordered an altar to Zeus erected in the Temple. He banned brit milah (circumcision) and ordered pigs to be sacrificed at the altar of the temple (the sacrifice of pigs to the Greek gods was standard ritual practice in the Ancient Greek religion). Antiochus's actions provoked a large-scale revolt. Mattityahu, a Jewish priest, and his five sons Jochanan, Simeon, Eleazar, Jonathan, and Judah led a rebellion against Antiochus. Judah became known as Yehuda HaMakabi ("Judah the Hammer"). By 166 BCE Mattathias had died, and Judah took his place as leader. By 165 BCE the Jewish revolt against the Seleucid monarchy was successful. The Temple was liberated and rededicated. The festival of Hanukkah was instituted to celebrate this event. Judah ordered the Temple to be cleansed, a new altar to be built in place of the polluted one and new holy vessels to be made. 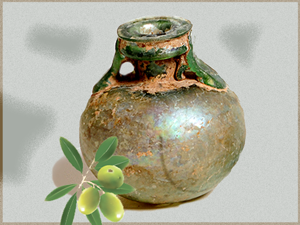 According to the Talmud, unadulterated and undefiled pure olive oil with the seal of the kohen gadol (high priest) was needed for the menorah in the Temple, which was required to burn throughout the night every night. 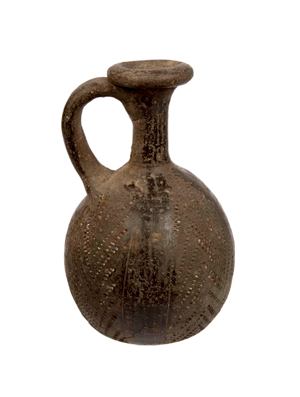 The story goes that one flask was found with only enough oil to burn for one day, yet it burned for eight days, the time needed to prepare a fresh supply of kosher oil for the menorah. An eight-day festival was declared by the Jewish sages to commemorate this miracle. The version of the story in 1 Maccabees states that an eight-day celebration of songs and sacrifices was proclaimed upon re-dedication of the altar, and makes no mention of the miracle of the oil. A number of historians believe that the reason for the eight-day celebration was that the first Hanukkah was a belated celebration of Sukkot and Shemini Atzeret. During the war the Jews were not able to celebrate these festivals, when lamps were supposed to be lit in the Temple (Suk.v. 2–4). Some modern scholars argue that the king was intervening in an internal civil war between the traditionalist Jews (Pharisees) and the Hellenized Jews (Sadducees) in Jerusalem. These competed violently over who would be the High Priest, with traditionalists with Hebrew/Aramaic names like Onias contesting with Hellenizing High Priests with Greek names like Jason and Menelaus. In particular Jason's Hellenistic reforms would prove to be a decisive factor leading to eventual conflict within the ranks of Judaism. Other authors point to possible socioeconomic reasons in addition to the religious reasons behind the civil war. What began in many respects as a civil war escalated when the Hellenistic kingdom of Syria sided with the Hellenizing Jews in their conflict with the traditionalists. As the conflict escalated, Antiochus took the side of the Hellenizers by prohibiting the religious practices the traditionalists had rallied around. This may explain why the king, in a total departure from Seleucid practice in all other places and times, banned a traditional religion. Hanukkah is not a "Sabbath-like" holiday, and there is no obligation to refrain from activities that are forbidden on the Sabbath as specified in the Shulkhan Arukh. Adherents go to work as usual, but may leave early in order to be home to kindle the lights at nightfall. There is no religious reason for schools to be closed, although in Israel schools close from the second day for the whole week of Hanukkah. Many families exchange small gifts each night, such as books or games. Fried foods (such as latke potato pancakes, jelly doughnut sufganiyot) are eaten to commemorate the importance of oil during the celebration of Hanukkah. 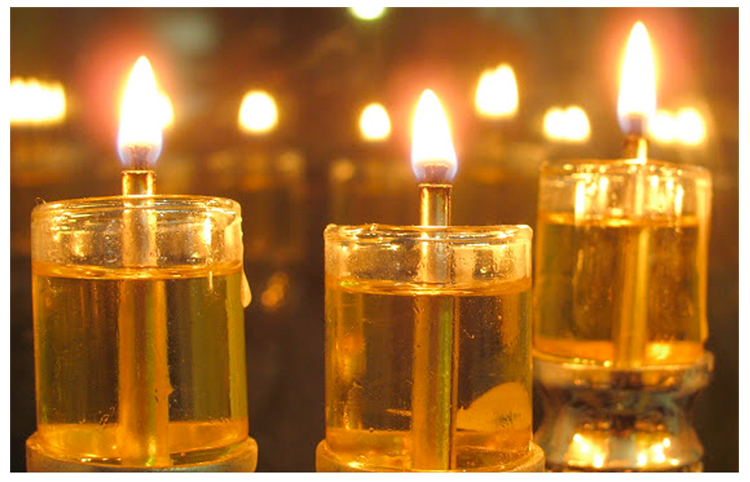 Each night, throughout the 8 day holiday, a candle or oil-based light is lit. As a universally practiced "beautification" (hiddur mitzvah) of the mitzvah, the number of lights lit is increased by one each night. An extra light called a shamash, meaning "attendant" or "sexton," is also lit each night, and is given a distinct location, usually higher, lower, or to the side of the others. The purpose of the extra light is to adhere to the prohibition, specified in the Talmud (Tracate Shabbat 21b–23a), against using the Hanukkah lights for anything other than publicizing and meditating on the Hanukkah miracle. This differs from Sabbath candles which are meant to be used for illumination and lighting. 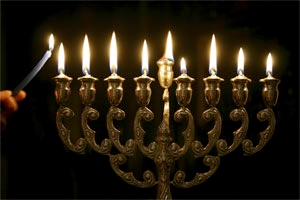 Hence, if one were to need extra illumination on Hanukkah, the shamash candle would be available and one would avoid using the prohibited lights. 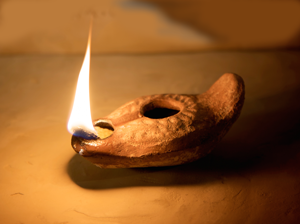 Some light the shamash candle first and then use it to light the others. Others light the Shamash after the others. So all together, including the shamash, two lights are lit on the first night, three on the second and so on, ending with nine on the last night, for a total of 44 (36, excluding the shamash). (Chanoch adds: Both these numbers are significant yet traditionally only the 36 is discussed and remembered. 36 represents the revealed Tzadikim while 44 represents blood the source of life force energy. The Tzadikim add to the life force energy of the blood (people) in the world). The lights can be candles or oil lamps. Electric lights are sometimes used and are acceptable in places where open flame is not permitted, such as a hospital room, or for the very elderly and infirm. Most Jewish homes have a special candelabrum referred to as either a chanukkiah (the modern Israeli term), or a menorah (the traditional classical name), or oil lamp holder for Hanukkah, which holds eight lights plus the additional shamashlight. Since the 1970s the world wide Chabad Hasidic movement has initiated public menorah lightings in open public places in many countries. The reason for the Hanukkah lights is not for the "lighting of the house within," but rather for the "illumination of the house without," so that passersby should see it and be reminded of the holiday's miracle (i.e. the triumph of the few over the many and of the pure over the impure). Accordingly, lamps are set up at a prominent window or near the door leading to the street. It is customary amongst some Ashkenazi Jews to have a separate menorah for each family member (customs vary), whereas most Sephardi Jews light one for the whole household. Only when there was danger of anti-Semitic persecution were lamps supposed to be hidden from public view, as was the case in Persia under the rule of the Zoroastrians or in parts of Europe before and during World War II. However, most Hasidic groups light lamps near an inside doorway and not necessarily in public view. According to this tradition the lamps are placed on the opposite side from the mezuzah so that when one passes through the door he is surrounded by the holiness of mitzvot (the commandments). The Kabbalah teaches that there is a stream of Shefa energy called the Ohr Ganuz (hidden light). Tradition teaches that this Ohr Ganuz is the Light that was created on the first day of creation. When one lights the Candles one makes connection with this Light and draws it into their homes or wherever the Candles are sitting. This is why the Kabbalists disagree with the Chabad organization who makes a grand celebration in public including open spaces. The Chabad Rebbe who was a topflight Kabbalist felt the public exposure was worth the potential abuse of the light. Generally women are exempt in Jewish law from time-bound positive commandments; however the Talmud requires that women engage in the mitzvah of lighting Hanukkah candles “for they too were involved in the miracle.” In practice in Orthodox households]] only the males in the household are obligated to light the menorah. Hanukkah lights should burn for at least one half hour after it gets dark. The custom of the Vilna Gaon (Elijah ben Shlomo Zalman Kremer 1720 - 1797) observed by many residents of Jerusalem as the custom of the city, is to light at sundown, although most Hasidim light later, even in Jerusalem. Many Hasidic Rebbes light much later, because they fulfill the obligation of publicizing the miracle by the presence of their Hasidim when they kindle the lights. Inexpensive small wax candles sold for Hanukkah burn for approximately half an hour so on most days this requirement can be safely ignored. Friday night presents a problem, however. Since candles may not be lit on the Shabbat itself, the candles must be lit before sunset. However, they must remain lit until the regular it is time for you to use longer candles or the traditional oil lamps. In keeping with the above-stated prohibition, the Hanukkah menorah is lit first, followed by the Shabbat candles which signify its onset. Typically three blessings (brachot; singular: brachah) are recited during this eight-day festival when lighting the candles: On the first night of Hanukkah, Jews recite all three blessings; on all subsequent nights, they recite only the first two. The blessings are said before or after the candles are lit depending on tradition. On the first night of Hanukkah one light (candle or oil) is lit on the right side of the Menorah, on the following night a second light is placed to the left of the first, and so on, proceeding from right to left over the eight nights. On each night, the leftmost candle is lit first, and lighting proceeds from left to right. If you are unable to find a copy of the Chanukah Blessings. Please ask me for a Copy. I will send a pdf file. Many copies of the Blessings follow a pattern of using the similar Bracha to Shabbat. On Shabbat the last words say Shell Shabbat. On Chanukah we avoid saying the word Shell so that the last three words are "LeHadlik Ner Chanukah" NOT LeHadlik Ner Shell Chanukah. The first letters of these three words "LeHadnik Ner Chanukah" form a triad that relates to healing. If we were to say Shell the Shin of Shell would interrupt the connection to the triad for healing. MOST PEOPLE DO NOT KNOW THIS AND SAY THE BLESSING LOSING THIS KAVENAH OPPORTUNITY. 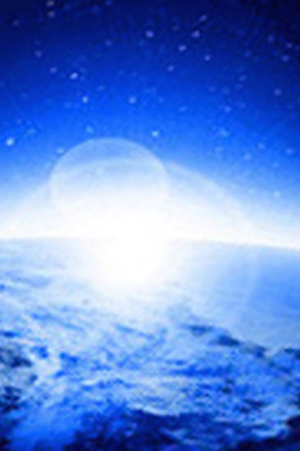 Deeper Meditations for the Chanukah Blessings and the NER Yichudim. During the half hour that the candles are burning, it is customary to do some spiritual actions and watch the candles. Songs, playing dreidel, Torah study, the exchange of gifts including Chanukah gelt for the children are all considered spiritual actions. Below are the words of some Chanukah songs. הנרות הללו אנחנו מדליקים על הנסים ועל הנפלאות ועל התשואות ועל המלחמות שעשית לאבותינו בימים ההם, בזמן הזה על ידי כהניך הקדושים. וכל שמונת ימי חנוכה הנרות הללו קודש הם, ואין לנו רשות להשתמש בהם אלא להאיר אותם בלבד כדי להודות ולהלל לשמך הגדול על נסיך ועל נפלאותיך ועל ישואותיך. Each night after the lighting of the candles, the hymn Ma'oz Tzur is sung. The song contains six stanzas. The first and last deal with general themes of divine salvation, and the middle four deal with events of persecution in Jewish history, and praises God for survival despite these tragedies (the exodus from Egypt, the Babylonian captivity, the miracle of the holiday of Purim, the Hasmonean victory), and a longing for the days when Judea will finally triumph over Rome. Dreidels / Spinning tops in a Jerusalem market After lighting the candles and Ma'oz Tzur, singing other Hanukkah songs is customary in many Jewish homes. Some Hasidic and Sephardi Jews recite Psalms, such as Psalms 30, Psalms 67, and Psalms 91. In North America and in Israel it is common to exchange presents or give children presents at this time. In addition, many families encourage their children to give tzedakah (charity) in lieu of presents for themselves. An addition is made to the "hoda'ah" (thanksgiving) benediction in the Amidah (thrice-daily prayers), called Al ha-Nissim ("On/about the Miracles"). This addition refers to the victory achieved over the Syrians by the Hasmonean Mattathias and his sons. "We thank You also for the miraculous deeds and for the redemption and for the mighty deeds and the saving acts wrought by You, as well as for the wars which You waged for our ancestors in ancient days at this season. In the days of the Hasmonean Mattathias, son of Johanan the high priest, and his sons, when the iniquitous Greco-Syrian kingdom rose up against Your people Israel, to make them forget Your Torah and to turn them away from the ordinances of Your will, then You in your abundant mercy rose up for them in the time of their trouble, pled their cause, executed judgment, avenged their wrong, and delivered the strong into the hands of the weak, the many into the hands of few, the impure into the hands of the pure, the wicked into the hands of the righteous, and insolent ones into the hands of those occupied with Your Torah. Both unto Yourself did you make a great and holy name in Thy world, and unto Your people did You achieve a great deliverance and redemption. Whereupon your children entered the sanctuary of Your house, cleansed Your temple, purified Your sanctuary, kindled lights in Your holy courts, and appointed these eight days of Hanukkah in order to give thanks and praises unto Your holy name." The same prayer is added to the grace after meals. In addition, the Hallel (praise) Psalms 113 - Psalms 118) are sung during each morning service and the Tachanun penitential prayers are omitted. The Torah is read every day in the shacharit morning services in synagogue, on the first day beginning from Numbers 6:22 (according to some customs, Numbers 7:1), and the last day ending with Numbers 8:4. Since Hanukkah lasts eight days it includes at least one, and sometimes two, Jewish Sabbaths (Saturdays). The weekly Torah portion for the first Sabbath is almost always Mikketz, telling of Joseph's dream and his enslavement in Egypt. The Haftarah reading for the first Sabbath Hanukkah is Zechariah 2:14 – Zechariah 4:7. When there is a second Sabbath on Hanukkah, theHaftarah reading is from 1Kings 7:40 - 1Kings 7:50. The Hanukkah menorah is also kindled daily in the synagogue, at night with the blessings and in the morning without the blessings. The menorah is not lit on the Sabbath, but rather prior to the beginning of the Sabbath at night and not at all during the day. During the Middle Ages "Megillat Antiochus" was read in the Italian synagogues on Hanukkah just as the Book of Esther is read on Purim. It still forms part of the liturgy of the Yemenite Jews. The last day of Hanukkah is known as Zot Hanukkah, from the verse read on this day in the synagogue Numbers 7:84, Zot Chanukat Hamizbe'ach: "This was the dedication of the altar." According to the teachings of Kabbalah and Hasidism, this day is the final "seal" of the High Holiday season of Yom Kippur, and is considered a time to repent out of love for God. In this spirit, many Hasidic Jews wish each other Gmar chatimah tovah ("may you be sealed totally for good"), a traditional greeting for the Yom Kippur season. It is taught in Hasidic and Kabbalistic literature that this day is particularly auspicious for the fulfillment of prayers. Many people define major Jewish holidays as those that feature traditional holiday meals, kiddush, holiday candle-lighting, etc., and when all forms of work are forbidden. Only biblical holidays fit this criteria, and Hanukah was instituted some two centuries after the Bible was completed and canonized. Nevertheless, though Hanukah is of rabbinic origin, it is traditionally celebrated in a major and very public fashion. The requirement to position the menorah, or Hanukiah, at the door or window symbolizes the desire to give the Hanukah miracle a high profile. Some Jewish historians suggest a different explanation for the rabbinic reluctance to laud the militarism. First, the rabbis wrote after Hasmonean leaders had led Judea into Rome’s grip and so may not have wanted to offer the family much praise. Second, they clearly wanted to promote a sense of dependence on God, urging Jews to look toward the divine for protection. They likely feared inciting Jews to another revolt that might end in disaster, like the 135 C.E. experience. With the advent of Zionism and the state of Israel, however, these themes were reconsidered. In modern Israel, the national and military aspects of Hanukkah became, once again, more dominant. In North America especially, Hanukkah gained increased importance with many Jewish families in the final decades of the 20th century, including large numbers of secular Jews, who wanted a Jewish alternative to the Christmas celebrations that often overlap with Hanukkah. Though it was traditional among Ashkenazi Jews to give "gelt" or money coins to children during Hanukkah, in many families this has changed into gifts in order to prevent Jewish children from feeling left out of the Christmas gift giving. While Hanukkah is a relatively minor Jewish holiday, as indicated by the lack of religious restrictions on work other than a few minutes after lighting the candles, in North America, Hanukkah in the 21st century has taken a place equal to Passover as a symbol of Jewish identity. Both the Israeli and North American versions of Hanukkah emphasize resistance, focusing on some combination of national liberation and religious freedom as the defining meaning of the holiday. A large number of songs have been written on Hanukkah themes, perhaps more so than for any other Jewish holiday. Some of the best known are "Hanukkiah Li Yesh" ("I Have a Hanukkah Menorah"), "Ocho Kandelikas" ("Eight Little Candles"), "Kad Katan" ("A Small Jug"), "S'vivon Sov Sov Sov" ("Dreidel, Spin and Spin"), Haneirot Halolu" ("These Candles which we light"), "Mi Yimalel" ("Who can Retell") and "Ner Li, Ner Li" ("I have a Candle"). The most well known in English-speaking countries include "Dreidel, Dreidel, Dreidel" and "Chanukah, Oh Chanukah." There is a custom of eating foods fried or baked in oil (preferably olive oil) to commemorate the miracle of a small flask of oil keeping the flame in the Temple alight for eight days. Traditional foods include potato pancakes, known as latkes in Yiddish, especially among Ashkenazi families. 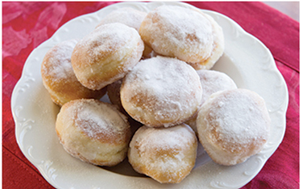 Sephardi, Polish and Israeli families eat jam-filled doughnuts (Yiddish: פאנטשקעס pontshkes), bimuelos (fritters) and sufganiyot which are deep-fried in oil. Bakeries in Israel have popularized many new types of fillings for sufganiyot besides the traditional strawberry jelly filling, including chocolate cream, vanilla cream, caramel, cappuccino and others. In recent years, downsized, "mini" sufganiyot containing half the calories of the regular, 400-to-600-calorie version have become popular. There is also a tradition of eating cheese products on Hanukkah recorded in rabbinic literature. This custom is seen as a commemoration of the involvement of Judith and women in the events of Hanukkah. 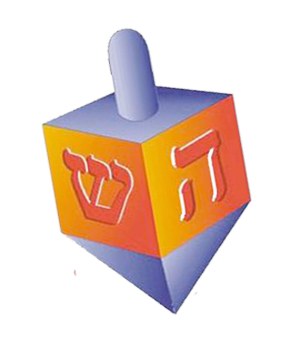 The dreidel, or sevivon in Hebrew, is a four-sided spinning top that children play with on Hanukkah.Each side is imprinted with a Hebrew letter. These letters are an acronym for the Hebrew words נס גדול היה שם (Nes Gadol Haya Sham, "A great miracle happened there"), referring to the miracle of the oil that took place in the Beit Hamikdash. (chanoch adds: In Israel the Sin is changed to a Pey for the word Po meaning Here). On dreidels sold in Israel, the fourth side is inscribed with the letter פ (Pe), rendering the acronym נס גדול היה פה (Nes Gadol Haya Po, "A great miracle happened here"), referring to the fact that the miracle occurred in the land of Israel.Stores in Haredi neighborhoods sell the traditional Shin dreidels as well. 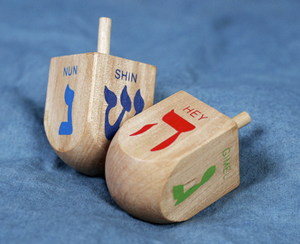 Some Jewish commentators ascribe symbolic significance to the markings on the dreidel. One commentary, for example, connects the four letters with the four exiles to which the nation of Israel was historically subject: Babylonia, Persia, Greece, and Rome. The dreidel is believed to commemorate a game devised by the Jews to camouflage the fact that they were studying Torah, which was outlawed by Greeks. The Jews would gather in caves to study, posting a lookout to alert the group to the presence of Greek soldiers. If soldiers were spotted, the Jews would hide their scrolls and spin tops, so the Greeks thought they were gambling, not learning. The historical context may be from the time of the Bar-Kohba war, 132-135 C.E. when the penalty for teaching Torah was death, so decreed by Rome. Others trace the dreidel itself to the children's top game Teetotum. Dreidel gelt (dreidel money): The Eastern European game of dreidel (including the letters nun, gimmel, hey, shin) is like the German equivalent of the totum game: N = Nichts = nothing; G = Ganz = all; H = Halb = half; and S = Stell ein = put in. In German, the spinning top was called a "torrel" or "trundl," and in Yiddish it was called a "dreidel," a "fargl," a "varfl" [= something thrown], "shtel ein" [= put in], and "gor, gorin" [= all]. When Hebrew was revived as a spoken language, the dreidel was called, among other names, a sevivon, which is the one that caught on. 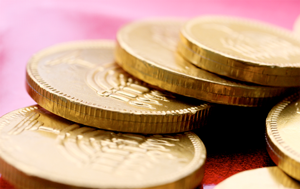 Hanukkah gelt (Yiddish for "money") is often distributed to children to add to the holiday excitement. The amount is usually in small coins, although grandparents or relatives may give larger sums. In Israel, Hanukkah gelt is known as dmei Hanukkah. The tradition of giving Chanukah gelt dates back to a long-standing East European custom of children presenting their teachers with a small sum of money at this time of year as a token of gratitude. The connection may be etymological: In Hebrew, the words "Hanukkah" (dedication) and "hinnukh" (education) come from the same root. In time, money was also given to children to keep for themselves. According to Magen Avraham (Abraham Abele Gombiner 1635 - 1682), poor yeshiva students would receive a gift of money from their Jewish benefactors on Hanukkah. In the 1920s, American chocolatiers picked up on the gift/coin concept by creating chocolate gelt. Many Hasidic Rebbes distribute coins to those who visit them during Hanukkah. Hasidic Jews consider this to be a segulah (merit / good luck) for success. Each Law of the Chanukah Lights (Halacha) is Created to subdue a force of foreign darkness. This is the traditional Kabbalistic teaching of HaShem created this opposite this. From the teachings of Rabbi Sholom DovBer Schneersohn of Lubavitch; adapted by Moshe Kravitz. The Rabbis taught: "The mitzvah of the Chanukah candle is to place it in the outer part of the doorway of the house" (Shabbat 21b). This is when the door of the house opens onto a public thoroughfare, but if it opens onto a private yard, the candle is to be placed by the front gate of the yard (Tosafot). Rashi comments that the reason why the candle should be outside is to publicize the miracle of Chanukah. Unlike Tosafot, Rashi deems it sufficient to set it by the door of the house even when the door opens on to a yard. Where in the doorway do we place it? At the left side, so that the mezuzah is to the right of the person lighting and the Chanukah candle is to his left (Shabbat 22a). The Tur, the halachic work of Yaakov ben Asher (ch. 671), writes that if for some reason the doorway does not have a mezuzah, the Chanukah candle should then be placed on the right side. 1) Why the most important thing is for the Chanukah candle to shine towards the outside (either to the public domain or to the yard - unlike the mezuzah, it has no intrinsic connection to the door of the house). 2) What is the significance of placing the Chanukah candle on the left side? 3) Since the Gemara states that the reason the Chanukah candle is placed at the left side of the doorway is in order to be opposite the mezuzah on the right, this indicates that there is a relationship between the two objects (and only when there is a mezuzah is the candle placed at the left; otherwise it is put on the right). What is this relationship? Before we can understand the above, we must first consider the verse "For the mitzvah is a candle and the Torah is light..." (Proverbs 6:23). Just as physical light is generated by a candle, the light of Torah is generated by a mitzvah candle. Without the candle of mitzvahs to dispel the darkness there can be no light of Torah! Through the mitzvah candle we attain the Torah light, which is the inner light of the Essence of G-d - the source of light that has to shine below in order to transform the spiritual darkness of this world into light. Briefly, the explanation of this is as follows: Mitzvahs can be performed only with physical substance. For example: tsitsit [tallit fringes] are made of physical wool, the Four Species waved on Sukkot are physical plants, and a mezuzah is written on physical parchment. Through doing mitzvahs with physical objects we can transcend the separateness of the physical that we perceive with our senses and realize our true nothingness in relation to G-d: that the created existence is nothing and the Creator is the true existence. Then G-dliness can be revealed through us and to us. When we meditate upon the verse "I, G-d have not changed" (Malachi 3:6), we understand that the apparent change (during Creation from spiritual into physical through the concealment of the spiritual) is only from our perspective; from G-d's perspective, however, there is no darkness or concealment of His Infinite Light. We contemplate further and we intellectually realize that even from our perspective there is no darkness and no concealment - only G-d's Infinite Light. Thinking about this truth evokes within us an intense desire to actually experience it. How can we accomplish this? Through learning Torah, the embodiment of G-d's wisdom and will in this physical world, and through fulfilling the mitzvahs, G-d's inner will (especially when we do so with joy). Now we can understand why the Chanukah candle is placed outside the doorway, on the left side. The Greeks defiled all the oil in the Temple chambers. Wisdom is compared to oil. The Greeks wanted to contaminate the wisdom of the Torah (Divine wisdom) with their intellectual wisdom. The positive wisdom of the Torah brings about a level of self-nullification that enables the one who learns it to fulfill Torah and mitzvahs and generally be a good person. One the other hand, the negative wisdom of the Greeks brings the one who learns it to feel himself to be a separate existence. He does whatever he wants to do, rather than what G-d expects of him. The Greeks wanted to neutralize the positive wisdom, the True Reality, with the negative wisdom, the perceived reality. They wanted to make the Jews forget that the Torah is G-d's Torah, and to deny G-d's existence by not allowing the Jews to do the chukim (statutes), those mitzvahs decreed by the Torah which cannot be understood (and rationally justified) by human intelligence. 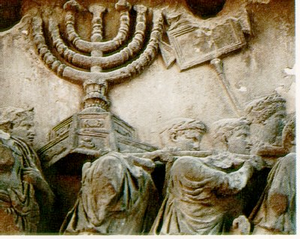 The Hasmoneans (Maccabees) overpowered and defeated the Greeks through their complete devotion to G-d, to the extent that they gave up their lives (their existence) to reveal G-d's existence (the idea of the mitzvah candle, see above). Afterwards, they instituted the lighting of the Chanukah candles, which is the same idea as the Torah light. The Chanukah candle is a revelation of the light of the future redemption, the light of the essence of G-d, the light which automatically dispels and transforms the darkness. This is why the Chanukah candle must be placed outside the door facing a public area. The outside, the domain of the public, reflects the idea of plurality, of separate existence. The Chanukah candle contains the capacity to light up even the realm that represents a denial of G-d's existence and a rebellion against Him. This darkness is automatically nullified by the light of Chanukah. The source of the negative forces is the left side. The Chanukah candle is placed on the left and shines towards the left; it lights up the negativity (darkness) of the left side. Rashi rules that it is permissible to put the Chanukah candle outside a front door that opens to a yard. The numerical value of the Hebrew word for yard, chatzer, is equivalent to that of bina-gevura-hod (understanding, severity, splendor), the three divine attributes (sefirot) of the left "line" (when they are schematically configured in the "tree of life"). Therefore, whether the Chanukah candle faces the public domain or the yard, it still accomplishes the same thing. This (effect of the Chanukah candle being placed on the left) is operative only if there is a mezuzah affixed on the right. Mezuzah is considered equivalent to all the mitzvahs combined. The mezuzah on the door of a house shows that everything in the house is nullified before G-d (that everything in it is for the sake of G-d). It is on the right side, the side of holiness, the right that attracts. It brings the physical close to the Divine and enables it to be nullified before G-d. Thus, we see that the mezuzah expresses perfectly the idea of the mitzvah candle. First we need to have the mitzvah light of the mezuzah on the right, and then we can have the Torah light of the Chanukah candle on the left. If there is no mezuzah on the right we put the Chanukah candle on the right, because it is also a mitzvah. In such circumstances, placing the Chanukah candle outside on the right is enough to reveal the light of Torah. The eating of dairy foods, especially cheese, on Hanukkah is a minor custom that has its roots in the story of Judith. The deuterocanonical book of Judith (Yehudit or Yehudis in Hebrew), which is not part of the Tanakh, records that Holofernes, an Assyrian general, had surrounded the village of Bethulia as part of his campaign to conquer Judea. After intense fighting, the water supply of the Jews is cut off and the situation became desperate. Judith, a pious widow, told the city leaders that she had a plan to save the city. Judith went to the Assyrian camps and pretended to surrender. She met Holofernes, who was smitten by her beauty. 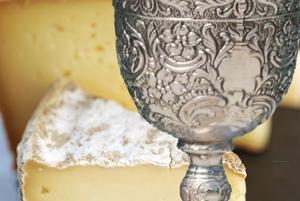 She went back to his tent with him, where she plied him with cheese and wine. When he fell into a drunken sleep, Judith beheaded him and escaped from the camp, taking the severed head with her (the beheading of Holofernes by Judith has historically been a popular theme in art). When Holofernes' soldiers found his corpse, they were overcome with fear; the Jews, on the other hand, were emboldened, and launched a successful counterattack. The town was saved, and the Assyrians defeated. 198 BCE: Armies of the Seleucid King Antiochus III (Antiochus the Great) oust Ptolemy V from Judea and Samaria. 175 BCE: Antiochus IV (Epiphanes) ascends the Seleucid throne. 168 BCE: Under the reign of Antiochus IV, the second Temple is looted, Jews are massacred, and Judaism is outlawed. 167 BCE: Antiochus orders an altar to Zeus erected in the Temple. Mattathias, and his five sons John, Simon, Eleazar, Jonathan, and Judah lead a rebellion against Antiochus. Judah becomes known as Judah Maccabee ("Judah the Hammer"). The Hasmonean Kingdom is the first time in the history of the Hebrew world when the political leadership and the spiritual leadership was in the same person or family. The only other time in history that this happened is when permission was given to write down the Oral Law which is the Talmud. In the case of the Hasmonean dynasty this combination is considered by the Hebrew Historians to be a mistake. It is important to have three leaders splitting the responsibility of spiritual, political, and judicial powers of government. 165 BCE: The Jewish revolt against the Seleucid monarchy is successful in recapturing the Temple, which is liberated and rededicated (Hanukkah). 142 BCE: Re-establishment of the Second Jewish Commonwealth. The Seleucids recognize Jewish autonomy. The Seleucid kings have a formal over lordship, which the Hasmoneans acknowledged. This inaugurates a period of population growth, and religious, cultural and social development. This included the conquest of the areas now covered by Transjordan, Samaria, Galilee, and Idumea (also known as Edom), and the forced conversion of Idumeans to the Jewish religion, including circumcision. 139 BCE: The Roman Senate recognizes Jewish autonomy. 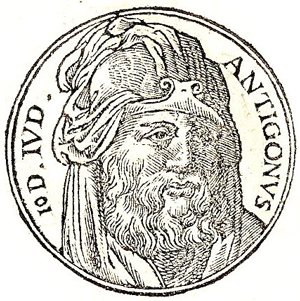 134 BCE: Antiochus VII Sidetes besieges Jerusalem. The Jews under John Hyrcanus become Seleucid vassals, but retain religious autonomy. 96 BCE: An eight-year civil war begins. 83 BCE: Consolidation of the Kingdom in territory east of the Jordan River. 63 BCE: The Hasmonean Jewish Kingdom comes to an end because of rivalry between the brothers Aristobulus II and Hyrcanus II, both of whom appeal to the Roman Republic to intervene and settle the power struggle on their behalf. The Roman general Gnaeus Pompeius Magnus (Pompey the Great) is dispatched to the area. 12 thousand Jews are massacred as Romans enter Jerusalem. The Priests of the Temple are struck down at the Altar. Rome annexes Judea. In my opinion, a close study of this process above will relate to the process of the imprisonment of the Jews in Germany from 1932 to 1939. Battle of Emmaus (Judas Maccabeus fights the forces of Lysias and Georgias). In 2013, on November 28, Hanukkah and the American holiday of Thanksgiving coincided for only the second time since Thanksgiving was declared a national holiday by President Abraham Lincoln. The last time was 1888, and the next time will be in the year 79,811. This convergence has prompted the creation of the portmanteau neologism Thanksgivukkah. 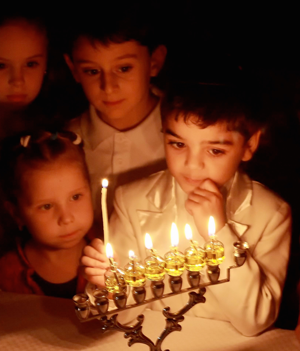 Some Jews in North America and Israel have taken up environmental concerns in relation to Hanukkah's "miracle of the oil," emphasizing reflection on energy conservation and energy independence. An example of this is the Coalition on the Environment and Jewish Life's renewable energy campaign.